The vibrant colors of the male Eastern Bluebird make it one of the most recognized species in the Mid-Atlantic region. Bluebirds can be spotted on low perches along edges of meadows, open woods, forest clearings, and ponds. Historically they primarily nested in woodpecker holes and dead tree cavities. Unfortunately, deforestation has reduced habitat for cavity-nesting birds that rely on hollow dead trees for housing. Furthermore, invasive species like starlings and house sparrows outcompete them for the remaining nesting cavities. Development that leads to urban sprawl and pesticides use further degrades their habitat and food supply, since they forage for insects and berries. As a result, in the early 20th century bluebird populations declined by an estimated 90%. Fortunately some species, including the bluebird, adapt well to man-made nesting boxes. Over the past 50 years, tireless conservation measures by caring people have shown promise in restoring their populations. 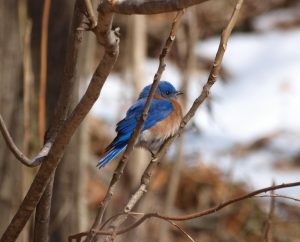 A number of our members have been helping to increase bluebird numbers in southern New Jersey by providing housing. Biologist Allen Jackson is Director of Wildlife Management at CU Maurice River and current President of the NJ Bluebird Society that he helped establish in 2011. With the assistance of CU members, Allen has been a tireless advocate, helping different organizations and individuals to provide proper nesting boxes for bluebirds. 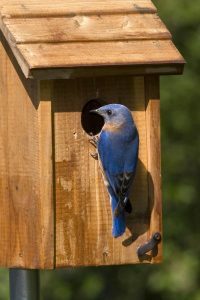 A series of bluebird boxes located along a property is traditionally referred to as a bluebird trail, because a monitor goes from one box to another documenting nesting activity. Monitoring bluebirds correctly is a key to successful production of young. Bluebirds will often have two clutches of young in a nesting season. Three broods are not uncommon. Spring weather is often a determining factor in how many young will be raised each year, so the overall production rate of fledglings can vary greatly. Members continue to increase the number of boxes available, but in any given year, even with more houses there can be fewer young if weather conditions are adverse. Other important factors play a role in success and failures. Providing a predator guard on a nesting box pole helps keep snakes, raccoons, opossums, and squirrels from climbing up to get at the young. Keeping boxes a safe distance from trees helps prevent flying squirrels from predating in the nesting box. Box design and regular monitoring can discourage use by unintended avian species. For instance some species need a perch to enter a hole but bluebirds do not. House sparrows, tree swallows, and house wrens all compete with bluebirds for housing. House sparrows are not native and create a nuisance for many native bird species. Tree swallows and house wrens are natives, but their impacts can be minimized by proper location of the box. Feral cats and house cats outdoors continue to play a role in the extinction of species worldwide. Since bluebirds hunt for insects in leaf litter they are especially vulnerable to being killed by cats. Responsible cat owners keep their cats inside. Also, because bluebirds eat insects they can be readily harmed by insecticide use and abuse. Nesting box design and placement are very important factors. Allen has enlisted woodshop teachers to follow specific specs and the end results can be astounding. For example, 60 boxes were constructed with supervision by a local woodshop class. These boxes were used to create 12 new trails that ultimately produced 180 young in one season. In 2016 over 2200 bluebird chicks were fledged in NJ. 2017 promises to be a great production year if the weather cooperates. You too can help grow our bluebird population. If you have large open areas on your property, like a pasture or organic farm, you might be a great candidate for a bluebird trail. Or if you do not own proper habitat but would like to monitor a trail on a wildlife management area or on a property where someone needs a manager, you can contact the CU Maurice River office at 856 300-5331 to see what opportunities for bluebird stewardship may be available.